You can set your clock by George Mary. The retired U.S. Air Force colonel and dentist keeps a rigid schedule that includes arriving at the NorthBay Cardiac and Pulmonary Rehabilitation department three days a week, promptly at 6:30 a.m. So when he didn’t arrive for his exercise session last Oct. 22, Karen Loewe, R.N., knew something was wrong. 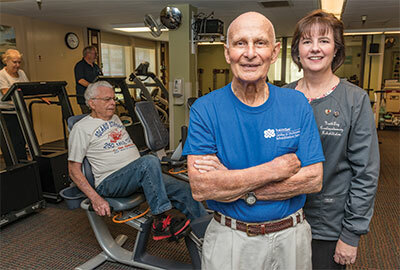 George had first been prescribed cardiac rehab following heart surgery in 2002 and he found the program so beneficial that he decided to stay for life. For 13 years, George had never missed his appointment without calling and he had become part of the cardiac rehab family. Karen called his home and got no answer. She called David Grant Medical Center to ask if he’d been admitted. He hadn’t. She waited, and then called his home again. No answer. The people in his exercise class were also growing concerned. Time passed and George was still missing. Karen couldn’t shake the feeling that something was terribly wrong. She wanted to drive to his house but couldn’t leave her other patients. So she did the next best thing—she called the Fairfield police and asked them to make a welfare check. That phone call saved George’s life. “I was never as happy as I was when I heard someone breaking down my front door,” George remembers. The 81-year-old Fairfield resident had collapsed on his bathroom floor and was too weak to move. He was taken by ambulance to David Grant, where he spent nine days on antibiotics before being transferred to a rehab facility in Vacaville. George has no memory of what actually happened before he awoke face down on his bathroom floor. Karen was overjoyed when she heard that her patient and friend had been found. Her next concern was for his home, probably left open with a broken front door. On her lunch hour she stopped at George’s house, only to find his neighbor, Fairfield Mayor Harry Price, busy replacing his lock. After work, she helped Mayor Price further clean the house. A few days later she was able to visit George in the hospital. For 20 years, Karen worked at both Summit and NorthBay Medical Center, mainly to ensure that she kept up her skills as a critical care nurse. She left the Bay Area hospital in 2012 to work full time as the clinical manager of NorthBay Cardiac and Pulmonary Rehabilitation. George had a long road to recovery, and his doctor is still not sure exactly what caused his collapse. During his stay in a Vacaville rehabilitation facility, he learned to walk again and practice the skills he needed to return home. Today he’s back to his routine working out in NorthBay Medical Center’s cardiopulmonary rehabilitation program, grateful to be under Karen’s watchful eye again. What is Cardiac & Pulmonary Rehabilitation? NorthBay Cardiac and Pulmonary Rehabilitation is a medically supervised program that helps improve the health and well-being of patients diagnosed with heart or lung disease. It is particularly beneficial for patients recovering from heart attacks, the placement of stents, congestive heart failure or heart surgery. Patients with chronic lung or heart disease may find that the program increases their stamina and helps them breathe easier. The program includes exercise training monitored by specially trained nurses, health education and support to help the patient return to an active life. The program is nationally certified by the American Association of Cardiovascular and Pulmonary Rehabilitation. Located within NorthBay Medical Center, the service is available Monday through Friday, from 6:30 a.m. to 3:30 p.m. For more information, please call (707) 646-5072.